Siena, Italy; London, UK; Port au Prince, Haiti; Bregenz, Austria; Tuscany, Italy; Bolivia; Moscow, Russia. The action opens in a frenetic car chase along the banks of Lake Garda in Italy. James Bond is tailed in his Aston Martin DBS by members of Quantum in Alfa Romeo's. The chase winds through tunnels until the last car meets its fate in a marble quarry. Free of his enemies, 007 rolls in to an MI6 safe house in Siena where he delivers his package to M - Mr White. The title is taken from a short story included in Ian Fleming's 1960 anthology "For Your Eyes Only". 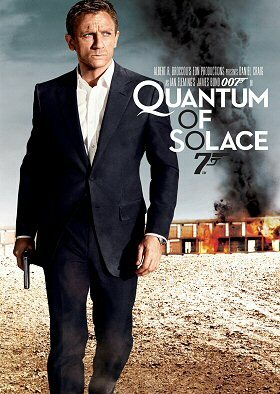 However, "Quantum of Solace" was first published in the May 1959 edition of Modern Woman magazine. The film does not use any element of the short story other than its title. 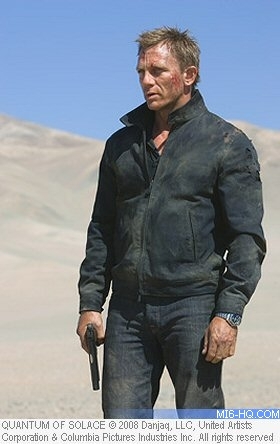 Above: Daniel Craig is James Bond 007. Due to censorship regulations, some scenes have been eliminated locally. In Saudi Arabia, both shots of Fields semi-naked (with and without oil) were removed. - A shot showing Bond enjoying the end of Tosca and straightening his tie. - A moment where Fields was "feeling terrible" after Mathis gives Bond the party invitation and notices what they have been doing. A scene showing Mr White's ultimate fate and the identity of his superior was filmed and included in early cuts to conclude the film. Mentioned in the film as one of the Prime Minister's closest advisors, Guy Haines is also a senior member of the shadowy organisation 'Quantum'. 007 discovers his presence during the Tosca opera scene where Dominic Greene holds a meeting of Quantum members. The movie was originally intended to end with a one-minute sequence where 007 introduces himself to Mr Haines at his estate, setting up the next adventure. The gun-barrel sequence, uniquely positioned at the end of "Quantum of Solace", would have appeared after Bond dispatches Mr White for good. The scene was shot over one day on location in London on April 14th 2008. 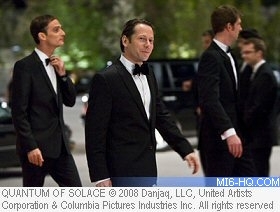 Bond: "I don't have any friends"
The CIA, Greene and Bond take flights to "Bregenz, Austria" for the opera. However, Bregenz does not have an airport. For the first time in the series, the film ends with the traditional gunbarrel just before the credits roll. Bond's business card for Universal Exports lists his name as R. Sterling. 007 used this cover name (Robert Sterling) before in "The Spy Who Loved Me".